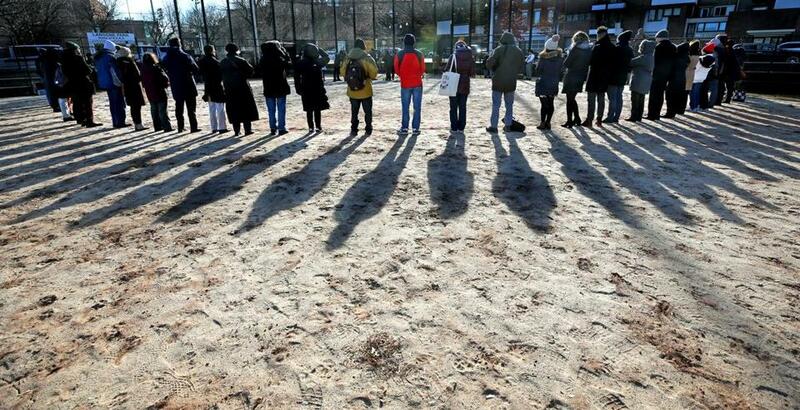 People stood in a circle during the 100th anniversary ceremony of the Great Molasses Flood at Langone Park in the North End section of Boston on Tuesday. Researchers from the University of Massachusetts Boston recently used ground-penetrating radar to determine the location of the giant molasses tank that caused the Great Molasses Flood of 1919. The location of the tank was marked by colored flags Tuesday morning when city officials and history buffs gathered at Langone Park in the North End to mark the 100th anniversary of the disaster. More than 60 people formed a circle where the molasses tank once stood to commemorate the centennial of the disaster that unfolded when the massive tank burst and set loose a deadly tidal wave of molasses that killed 21 people and injured dozens of others a century ago. 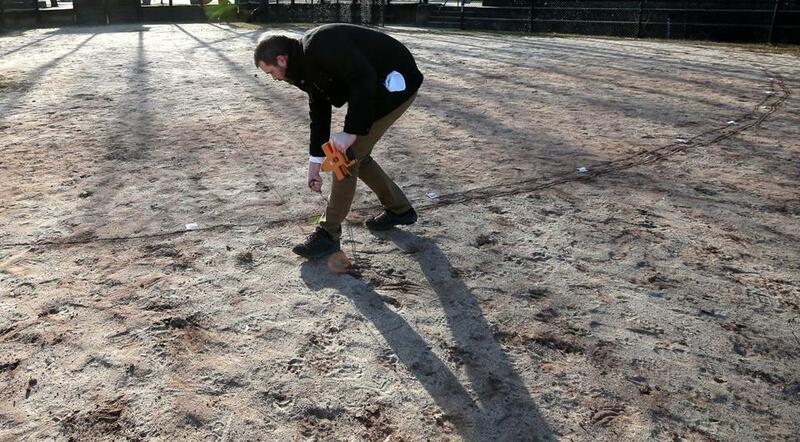 Joe Bagley, the city archeologist, thanked John Steinberg, a research scientist at the Fiske Center for Archaeological Research at the University of Massachusetts Boston, and his team for conducting the geophysical survey of the site. The infamous molasses tank was owned by Purity Distilling Company and measured 50 feet tall and 90 feet in diameter, according to a Fiske Center blog post. Today, the site of the tank is known as Langone Park, and a softball diamond occupies where the infamous molasses tank once stood. At Tuesday’s ceremony, Christopher Cook, the city’s parks commissioner and chief of environment, energy, and open space, read the names of the 21 victims who died in the Great Molasses Flood. “It’s important to preserve our history, and today, we remember an incredible event — a tragic event,” Cook said. A moment of silence was held, and State Representative Aaron Michlewitz took part in the wreath-laying ceremony. Cook reflected on the destruction that happened a century ago and how the sudden the loss of life affected so many Bostonians and the city as a whole. Joe Bagley, the city archeologist, marked off the the site of the tank. One of the victims who died in the molasses flood was George Layhe, a Boston firefighter. According to reports in The Boston Globe, Layhe had been standing in the doorway of the Engine 31 firehouse when the explosion occurred and was buried by debris when the building collapsed. On Tuesday, the Boston Fire Department posted a photo of Layhe on Twitter to mark the 100th anniversary of his death. Brett Holladay, 53, was raised on Beacon Hill and now lives in Beverly. He was one of dozens of people who attended the ceremony at Langone Park on Tuesday morning. He’d heard about the Great Molasses Flood since he was young but didn’t know the details about what transpired. “My father used to tell me about it and we’d laugh,” he said. Holladay said he was glad that he attended the ceremony because he learned more about the tragedy and how serious it was.